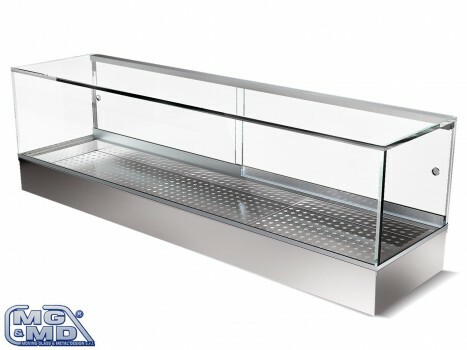 “Sushi – Snack” model display case it’ s one static or ventilated refrigerated tank with glass frame structure and plexiglass back doors. Inside can be insert perced stainless trays (for showing the product on “bed of ice”), gn containers to 1-3 h.40 mm or smooth steel plans (for classical exposure). The temperature control is through the electronic unit supplied or set in the control panel with remote connection to be connected by 1 metre of distance.